In the beginning, there was the kazoo. The people were happy, but they wanted more. Along came the electric kazoo. And it too was good, for a while. 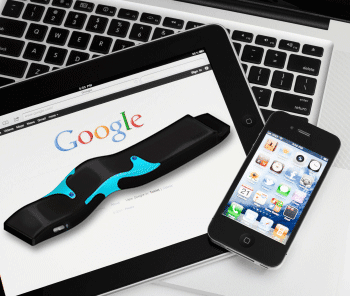 The year is 2013, and the world is finally ready for the electronic kazoo. The iKazoo is the brainchild of a small team of enthusiastic gadgeteers called Ogaco Gadgets, and it’s easily one of the most intriguing pieces of gadgetry we’ve seen in a while. In a nutshell, the iKazoo is an open source electronic controller with near-infinite applications. From making music to interactive gaming to remotely controlling your Android or iOS devices, this gadget will blow you away with possibility. As a result of its versatility and open source nature, the iKazoo is difficult to define. What we do know is that it not only sports an impressive array of modern sensors, but it’s also crammed with more electronics than you can shake a kazoo at. Inside the iKazoo you’ll find a very interesting host of components, including an Arduino compatible microcontroller, bi-directional Bluetooth, mini USB, microphone, accelerometer, multi-touch sensors, and even a headphone jack. Now, there’s surely a lot to say about this little piece of mad genius and what it can do, but unlike most gadgets of this sort the creators themselves say it best. Check out the video below and be sure to head over to the iKazoo IndieGoGo campaign if you’d like to get behind this thing or pre-order your very own. If you’ve ever wanted to be in on something ‘before it was cool’, well here’s your chance. Maybe.